Illingworth-Blog is a collection of anything at all to do with the village of Illingworth. Your input is vital to make this site worth revisiting time and time again. So, please add any input at all using the form at the bottom of this page. We are a local community group that has been set up in an attempt to save and preserve the Grade II* Gaol and Stocks in Illingworth; a small village in the town of Halifax in West Yorkshire. Built in 1823, the plaque is inscribed: "Let him that steals go and steal no more, but rather let him labour, working with his hands the thing which is good that he may have to give him that needeth." Our aim is to restore the Gaol and Stocks to its former glory and eventually use the building for educational and community purposes. We want to ensure that our local history is not destroyed but is preserved for future generations. Calderdale Council has announced plans to sell the former Illingworth jail in Keighley Road, a most interesting survival from the past as Halifax no longer has any traces of its other old prisons. Over the building's entrance is an oval fanlight and a little higher up on either side is a small window, all with bars. Above the door is a carved tablet, set into the wall, with the date 1823 and this proverb: "Let him that stole steal no more but rather let him labour with his hands the thing which is good that he may have to give to him that needeth." Originally the jail was just one storey tall. It had four cells, which were mainly used to hold prisoners waiting to be placed in the nearby stocks for punishment. The jail's old door was made of wood, studded with bolts, its back being covered by an iron sheet. It seems likely that a second storey was added in about 1823. Nearby lived the village constable. When a wrongdoer was caught at night the constable carried from his home a small bedstead, kept for the purpose, and the prisoner slept on it until he was removed early the following morning to appear before the Halifax magistrates. 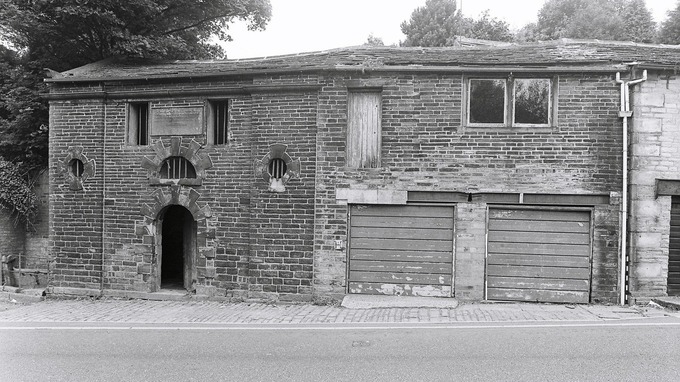 At some time during the mid-1860s the jail was no longer needed and the building was leased to the Illingworth Industrial Provident Society, whose shop, now converted to garages, then adjoined it. Later the Co-op became the owner and it was adapted as a storehouse. 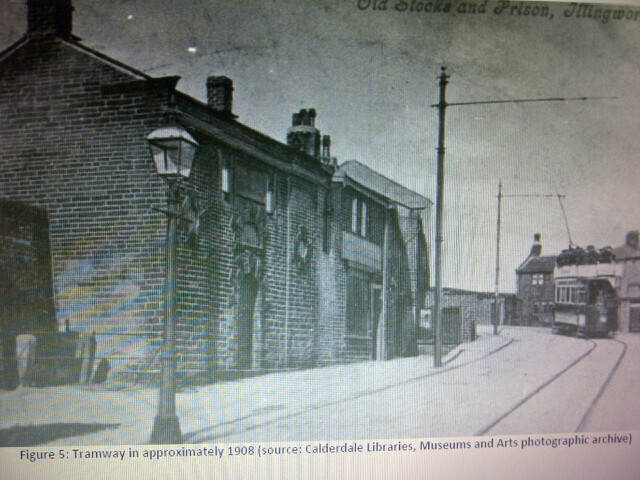 In recent years Calderdale Council has used it for storage. 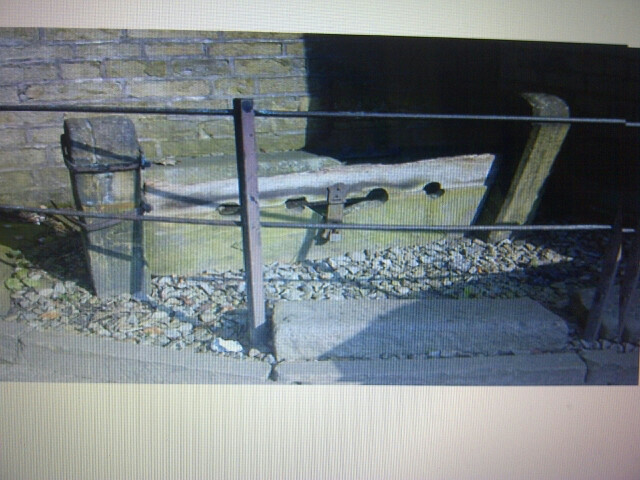 The nearby stocks are probably the most interesting surviving in Calderdale. They are far older than the prison and were built to hold two culprits, side by side. These are the only local stocks that can be dated, one post being dated 1697 with the initials GK, George Kitchinman, who was constable of Ovenden township in that year and who oversaw the erection of the stocks. For about 170 years Illingworth's stocks were used for punishing minor misdemeanours and they were in frequent demand. One account tells us that "sabbath breaking, excessive conviviality and a variety of minor offences had to be exculpated in this way and such was the number of offenders in certain festive seasons, so it is said, that they had to line up for punishment in the manner of the present-day queue. "Offenders in the stocks had to suffer the jeers of passers-by and were often targeted by "all sorts and conditions of missiles, not always of the most enticing description". This penal custom seems to have died out in the mid- 1860s. The Courier of January 17, 1864 records: "Wm Riley, a delver residing at Moor End, sat three hours in the stocks at Illingworth in default of paying a magisterial fine of 11s 10d (59p) for gambling." The last person to suffer in the stocks was a man nicknamed "Jim Pig". His punishment was imposed for being drunk and disorderly – and not for the first time! However, there is a later record of a man who volunteered to sit in the Illingworth stocks towards the end of the 19th century. His name is not recorded but he was a wagoner travelling from Halifax to Keighley who had enjoyed too much alcohol. He implored a group of villagers gathered outside the old Talbot Inn to let him sit in the stocks and, after some consultation, one went to fetch the key to unlock them. With much good humour the wagoner's wish was granted and he was firmly locked in position. There he sat for a long while in an inebriated state, passing in and out of consciousness. After many hours he regained his senses and demanded to be released. But the villagers were in no hurry to let him go. For an hour the prisoner's request to be freed fell on deaf ears, but eventually he was let go. To quote an account of 1911: "Language of a particularly virile type was used to express his opinions of the treatment he had received and then, vigorously cracking his whip, he, the horse, and the wagon moved on at accelerated speed. "Let us hope that this old jail, which has a Grade II* preservation listing, is bought by someone who will care for it, keeping evidence of its unusual history.